Welcome to Driiv Autosport! 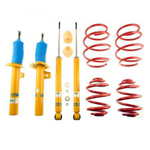 You've found our Bilstein Suspension section for Audi. We offer a wide variety of suspension components for your Audi, from standard lowering springs and coilover kits to complete suspension kits with springs, shocks, and mounting hardware all included. We also offer a variety of original equipment replacement suspension parts for your Audi. Shop with confidence, you're covered by our 100% customer satisfaction guarantee! If you're thinking about a long needed suspension upgrade for your Audi and you have questions, give us a call at 229-888-2060 and we'll help you make the right decision!